Bordspel sleeves met een afmeting van 87 x 130 mm. Deze verpakking bevat 50 sleeves. Geschikt voor diverse kaartspellen met oversized kaarten. This worked exactly as I wanted. 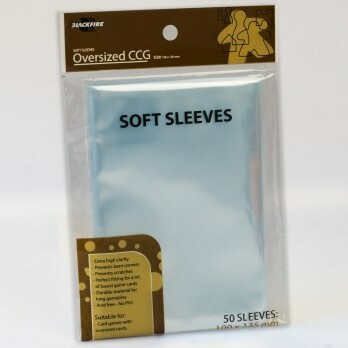 I was looking for a way to sleeve the oversize event cards of Kingdom Death: Monster. This sleeves are a little shorter, but combining 2 of them did the trick. Bare in mind that there are tiny size differences due to production, so you might need to get more packages to find the ones to cover the previous.